It takes a brave restaurateur to run an Indian virtually opposite a much-publicised competitor. But despite being in the shadow of the renowned Madhuban, the neighbouring Saaki continues to serve this small Hampshire village with good food. Assuming it doesn’t just survive off the overflow of people from up the road, which is unlikely, it must be doing something right to have been here for a number of years. One thing it offers, if its menu is to be believed, is an astonishing range of ‘New’ dishes on its menu. No fewer than 32 of the items on the menu are flagged as such and these certainly include some interesting dishes such as the delightfully named Chot Poti starter –a mix of chick peas, yellow lentils and potatoes cooked in lemon juice and spices – and the Lamb Tropical Mango using a blend of hot spices and mango chutney. Ah, when in Rome… First up in the new stakes is the Chicken Napalize (£7.95) a sort of less-cloying version of butter chicken with peppers and onions, delivered with the most uniform strips of chicken I’ve ever had in a curry. This I had with new garlic rice (£2.95). No holding back on the garlic here, so much so that I could sense the wild village snails slithering for cover as I strolled home. All good so far, but there in the new side dishes I found it: Tuk Baigon (£3.25), the best aubergine dish ever. 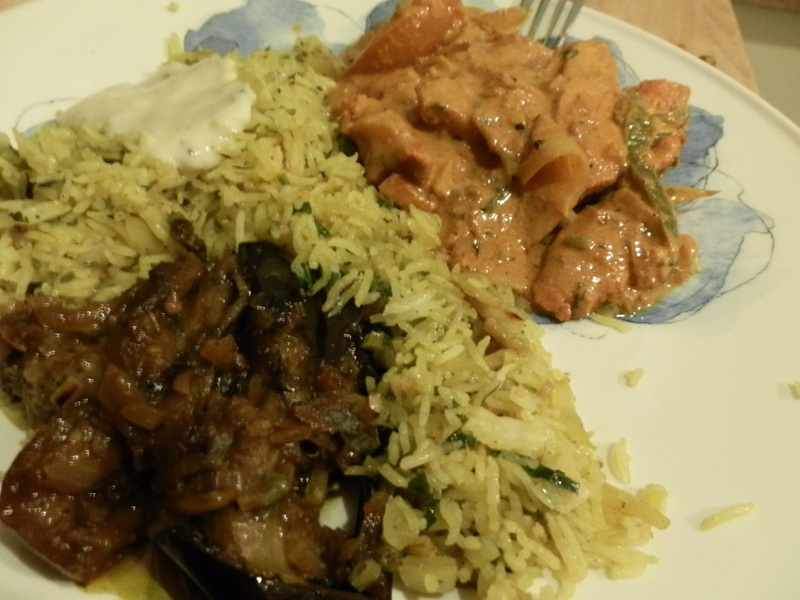 Mushy, but a good mushy, the aubergine is marinated in lemon juice and the tanginess just worked perfectly with the creamy chicken and rice. Three cheers for new. So once ordered it’s time for a pint of Cobra while waiting (I never can understand people who ring ahead so they don’t have to wait) while reading the papers in the waiting area which has been screened off nicely so you feel as if you are in the restaurant without intruding into the evening of other diners. Delivery: free within five miles for minimum orders of £10. Specials: 10% discount on takeaways. Beer while you’re waiting: Saaki is a fully licensed restaurant or the Whistle Stop pub is a short walk away. Saaki, 73 Station Road, Liss, Hampshire, GU33 7AD. Tel: 01730 895455. Open: daily noon–2pm, 5.30pm–11.30pm (midnight Fri–Sat). love the comment about garlic and the village snails! !